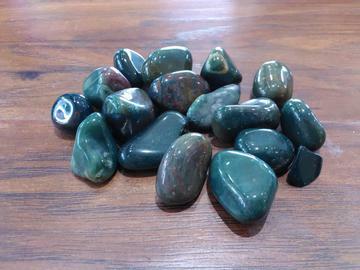 The mineral aggregate heliotrope, also known as bloodstone, is a variety of jasper or chalcedony. The bloodstone is green jasper with red inclusions of hematite. Bloodstones energy carries the purity of blood and speaks of life and birth, vitality and strength, passion and courage.It is both mystical and magical, and its virtues are protective and nurturing.